Combining versatility, ease of use and the latest in breathing apparatus design, Drager introduces the Personal Airline System PAS Micro. Drager's PAS Micro is a NIOSH approved 15 minute SCBA for emergency entry or escape. The PAS Micro is among the most technologically advanced short duration emergency escape units available using a Supplied Airline Respirator (Combination Pressure Demand type "C"), configured for up to 300 feet or 12 hose lengths sections, from the air source, which ever is greater. A back-mounted unit uses a similar carrying system configuration as traditional SCBA harness designs. The PAS Micro is ergonomically designed to follow the natural contours of the back, increasing wearer comfort and stability during use. The hose and pressure reducer have been integrated into the backplate, reducing the risk of snagging, protecting the pressure reducer and adding to the streamlined shape of the set. 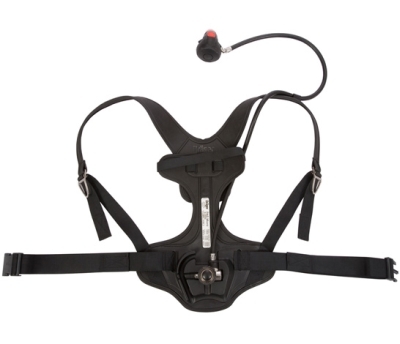 The technology used in the development ofthis set is inherited from Drager's advanced PSS range of breathing apparatus, designed for professional fire fighters. The buckles used are designed to be easily located, even when wearing gloves, for quick adjustment, but follow the contours of the set to reduce the risk of snagging. The harness has been constructed using an anti-static material inert to chemicals and oil, and impervious to most acids and alkalis. Benefiting from a high resistance to abrasion and heat, this new harness meets the requirements of EN137 heat and flame resistance. This means that the unit operates trouble free over temperature range of -22°F to 140°F and will self-extinguish with in 5 sec after exposure to flame temperature of 1742°F plus or minus 122°F. The Micro also is fully machine washable. Depending on the requirements of the operation, this unit has configurations that have been fully approved for use in applications requiring either; short duration entry units, airline emergency escape breathing apparatus, or dual function. Should the airline supply fail for any reason, the escape cylinder would be employed by simply opening the cylinder valve. New to our SAR system is the optional Low Pressure Airline warning whistle which activates in the event that the incoming air pressure drops below safe levels. Short Duration SCBA Entry and Combination SAR Unit has a low pressure cylinder warning whistle and a remote pressure gauge located at the waist to enable easy and regular checking during operation. A Supplied Air Respirator (SAR) pigtail can be added to this to make it a combination unit. Airline Work Unit with 15 minute Emergency Escape cylinder has a SAR pigtail, 15 minute escape cylinder for entry and working in hazardous environments, and comes without a remote cylinder pressure gauge.